Facing their second grudge match in two days, the Flyers need to find some energy in the physical and emotional tanks to pull out a victory. Most nights in the NHL winning is primarily the result of desire, not pure talent. See Toronto’s recent win over Detroit for proof. 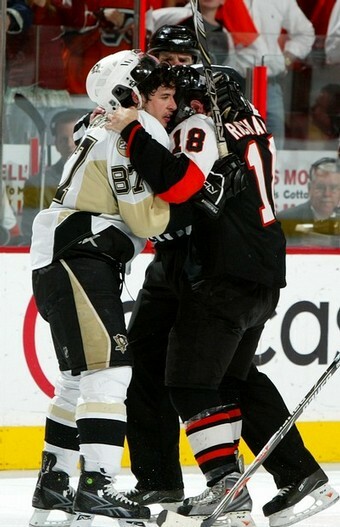 The rivalry between the Penguins and the Flyers usually gives the advantage to the home team. The fact that Evgeni Malkin shines in the Igloo only enhances that advantage for PIttsburgh. On the other hand, the absence of Sergei Gonchar and Ryan Whitney cannot be ignored. They’re slightly weakened, and the Flyers should seize their opportunity to pick up points on a division rival. On the Philadelphia end of the ice, expect Andrew Alberts to debut tonight in the Orange and Black. He’s a big defenseman who plays a physical game. Actually, he would have been valuable in last night’s match up. But he should be a nice addition while Randy Jones and Ryan Parent are out of the line up. A fairly even period from both teams. The Flyers dominated control early on, but the Penguins gradually gained the offensive zone in the second half. The Flyers must find ways to penetrate the Penguins’ defense. The Pens are keeping the Flyers to the perimeter, simplifying Marc-Andre Fleury’s job in the process. If I were John Stevens, I would spend this entire intermission stressing good, simple plays to my squad. I’ll be honest – I was worried there for a few minutes. The Flyers squandered their opportunities and allowed the opponent to gain a psychological edge. I expected to see at least one more Penguin goal before the period ended. And then Jeff Carter pulls out that glorious wrist shot. Add to that a Kimmo Timonen point shot with Mike Richards in front, and you have a tie game. The key to evening the score? Driving the net. The Flyers finally got some guys in front of the net, elevated the puck, and went for the dirty goals. They need at least one more of those, combined with rock solid defense, to finish this one off. Quick Thought – When the Flyers finally do get a shot on Fleury, he’s allowing the rebounds to shoot right out to the high slot. Except the Flyers don’t have anyone there. Luca Sbisa spent time on the ice during the last minute of play. I have never seen the Flyers show that much faith in a young player over veterans on the bench, let alone an 18-year-old rookie defenseman. Wow. I hate to raise this spectre yet again, but this might be season 2 of Danny Briere disappearing on the ice. The worst part of these invisible performances – his defensive play. Once again we see Briere cough up the puck in a key situation, only to have Pascal Dupuis pounce and score the winning goal with 10 seconds remaining in overtime. The Flyers had dominated much of the overtime play, seizing scoring chances and effectively shutting down even Crosby and Malkin. I simply don’t understand why Stevens opted to combine Briere and Lupul for those shifts. Lupul isn’t exactly known for strong defensive play, and Briere . . . enough said. Horrible. That said, Niittymaki showed his weakness yet again. He’s excels when the puck comes in tight with traffic surrounding the crease. But if shots start coming from the outer perimeter, especially unobstructed, Niitty seems unable to handle them properly. Looking on the bright side: the Flyers pick up their first point of the season. Hopefully the first of many. Preferably 100 or more.